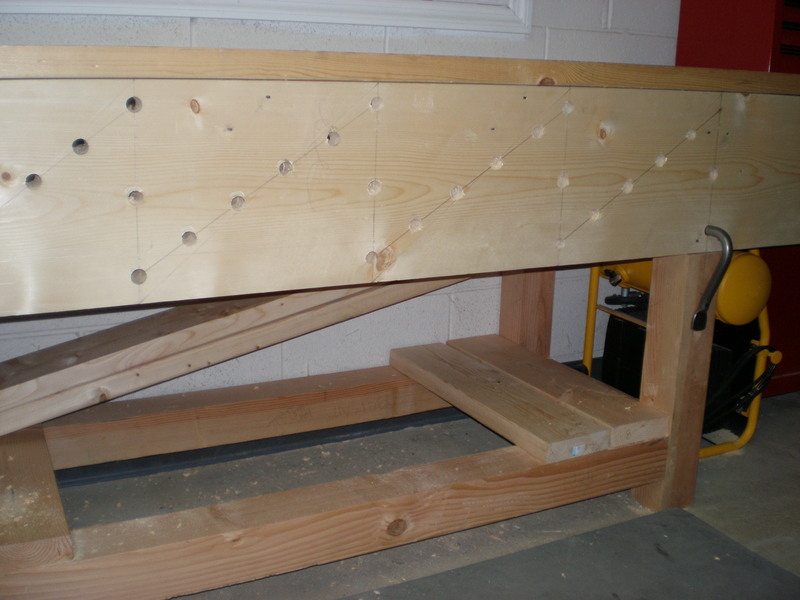 The top is on, holdfast holes are drilled, a planing stop is in place, and a shelf exists…she’s done! This post took place over a number of days. I wanted to break up the posts and detail each step, however I couldn’t get myself to stop working on the bench long enough to blog. My apologies if this post seems so long…I could see the finish line and didn’t want to stop until I finished. Before I attached the top, I had to finish the base. I installed two cross braces that will support the top. They sit on the back supports of the front and back apron, and are nailed in place through the aprons. Then I used my jack plane and a hand saw to bring everything into the same plane. Next up was the two top pieces. I started with the back section of the top…had to do a fair amount of planing to get a flat surface on the top and bottom faces. 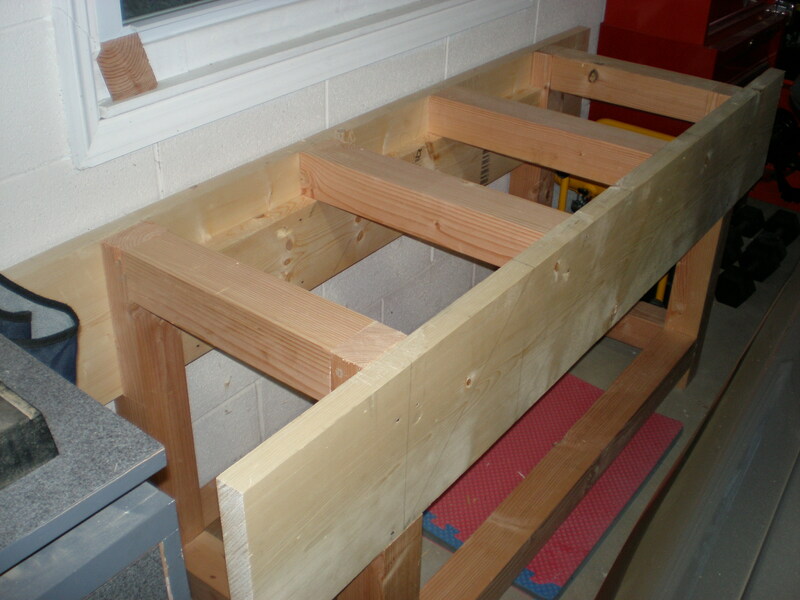 To help hol d the top boards in place when plaining the edges of the boards, I put my half-functioning bench to use. In order to do so, I marked out and bored all the holes for the holdfasts on the front apron. I changed my mind a few times on the layout…going back and forth between old drawings and pictures. I’m happy with what I settled on…I have a good amount of overlap of the holdfasts the entire length and width of the front apron. Everything fit together nicely once the blocking was in place. 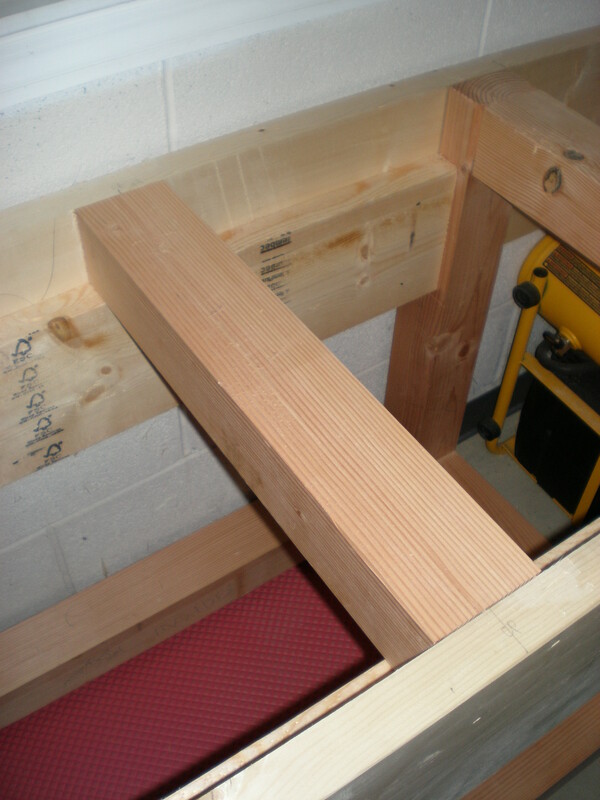 Therefore, I nailed on the top back using cut nails driven through the cross braces. I went over all of them with a nail set to prevent any issues when planing the top later on. I repeated the same process for the front piece of the top, including the blocking underneath. I adjusted the width of the front piece so I ended up with a 1/2″ gap between the two top pieces. Before I started to work on the shelf, I decided to put in the planing stop. I figured I could use it for surfacing the shelf boards. I had a good section left over from one of the legs…I think it’s about 10″ or so. I planed all four sides flat and square to each other. 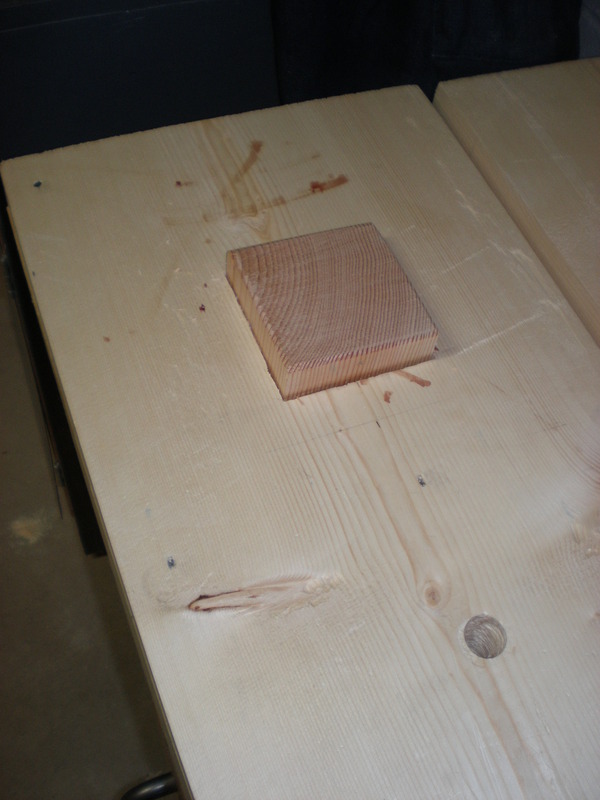 Then I used it to mark out for the mortise to cut in the top. I cut the mortise in the same manner that I cut the mortise for the leg assemblies, etc. I started by boring out the bulk of the waste with the largest bit I could find. Then I cleaned up the waste with my largest chisel. I made fairly quick work of it, but it cost me in the process. I slipped more than a few times, and beat the heck out of my knuckles… not to mention sliced my left index finger with my chisel again. I went to work the next day with five band aids and an immovable shoulder. I couldn’t just stop though…these injuries happened when I first started cleaning out the mortise…I cut most of it with a rag wrapped around my left hand. I am beginning to wonder if I am the only woodworker who gets hurt like this so often…why are there always blood in my pictures? Despite being prone to injury, the planing stop works great. I had to do a little more clean-up to get the nice tight fit that I wanted, but not much. I finished off the top of the stop by chamfering all the edges. The following night was all about holdfast holes. 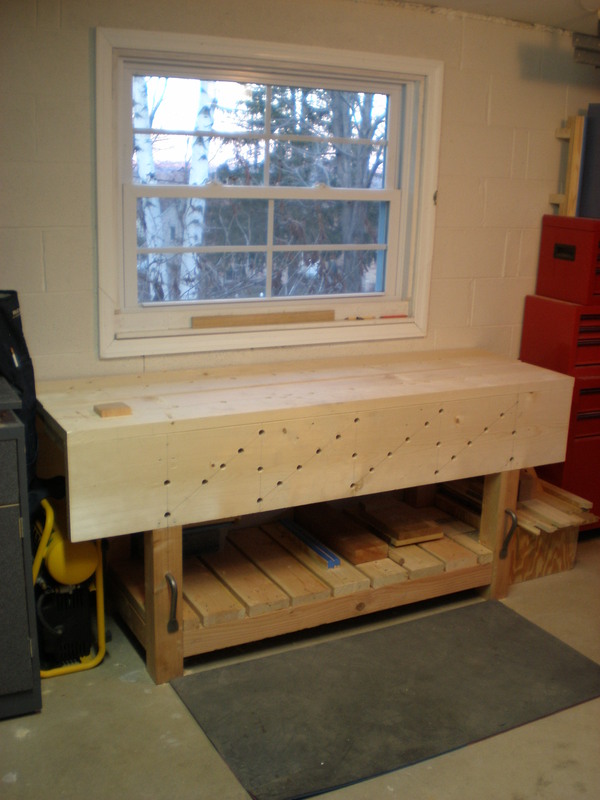 The first I put in was in-line with the holding stop on the back top piece…enabling me to put a small board across the width of the bench to work as a large planing stop. 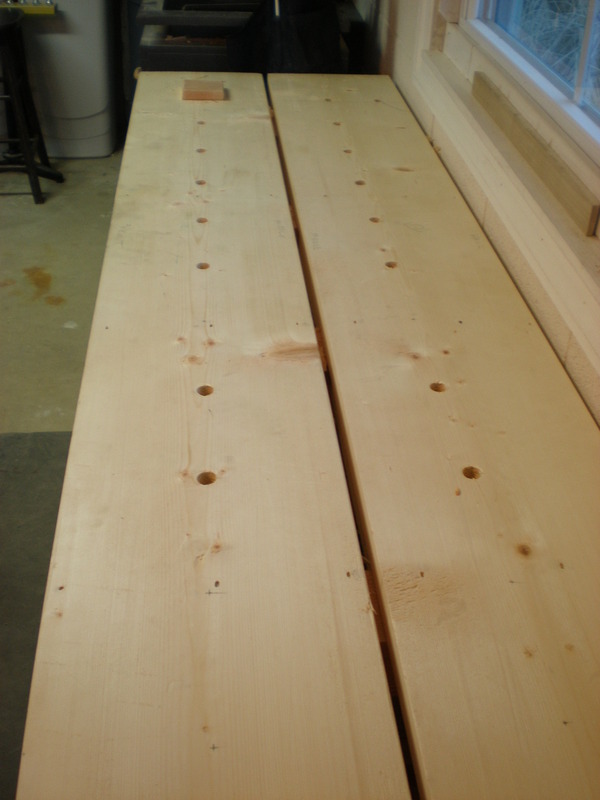 Then after some careful thought, I decided to place holdfast holes down the center of both top pieces the length of the bench. This enables me to clamp the entire length of the bench. I made sure to space the holes based upon my holdfasts and how much they overlap. The majority of the holes were no issues to make. There were two holes in the minority. The blocking on one section of the back piece of the top kept falling off while drilling one of the holes. I must have forgotten to flatten the mating face of this board because it was rocking a little. When I would try to drive a nail in one side, it would pull out the other. Finally, I took down the blocking, removed the nails, flatten the mating side, and glued and screwed it back in place. After this adjustment, I finished drilling the troublesome holdfast hole with ease. Over the next couple of nights, I worked on the shelf below the bench. I didn’t want anything fancy, just a functional shelf to hold my most used items. 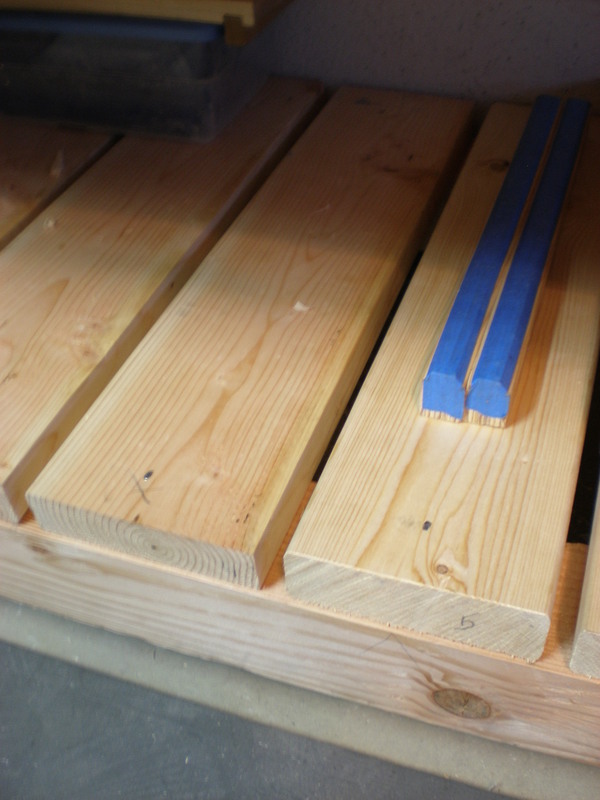 I planed up the boards so they sat flat with the bottom of the bench base. 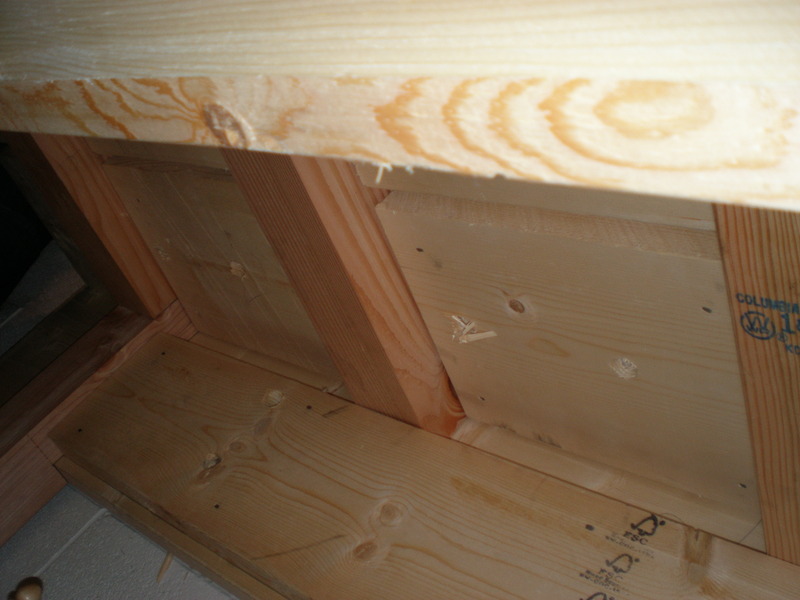 I attached them using cut nails driven into the lower cross braces that connect the two side assemblies. I made sure to start the first piece square. Then I used a 1/2″ spacer board to line up the next board. I continued making my way from left to right across the bench. I notched the two outer most boards to fit around the legs. …and then a bench was born! Thanks go out to Chris Schwarz and Bob Rozaieski for their incredible knowledge and inspiration…I could not have dont it without them! Here’s a slideshow of this part of the journey. It’s completed! Nicely done! I’m proud of you! Now how is your finger faring?